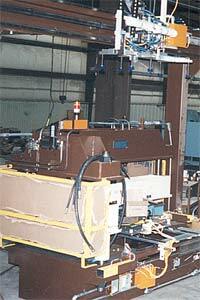 Manually loaded and Un-loaded L Shear for trimming flanges on refrigerator liners. 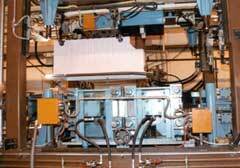 L-Shear used to trim flanges on high impact polystyrene thermoformed refrigerator liners, with overhead part transfer for automatically loading and unloading. 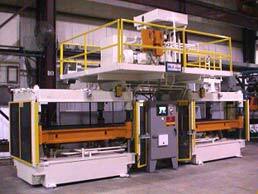 MLS Systems has built single and dual straight shear systems like the one pictured here. 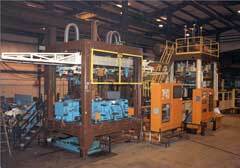 This station includes rotating liner locating tooling in front of the shear. View of serrated teeth on two post straight shear. 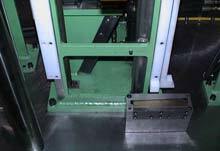 View of C-frame style straight shear for trimming refrigerator liners. 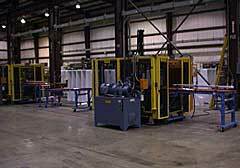 In addition to conventional methods of trimming, MLS Systems can add router capability to your line system for increased flexibility. 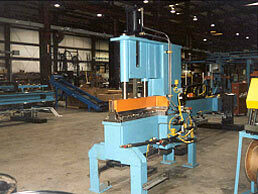 MLS Systems can integrate a router for trimming and profiling with your conventional trimming and piercing operations. 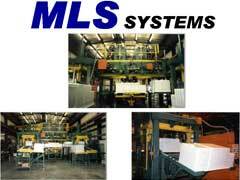 MLS Systems will custom design your router system to fit your application. 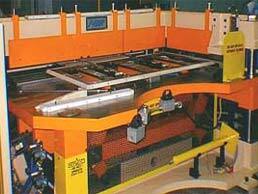 Above you see a gantry mounted router system with precision guiding. Shown above is a router equipped with a vacuum nozzle for chip removal. 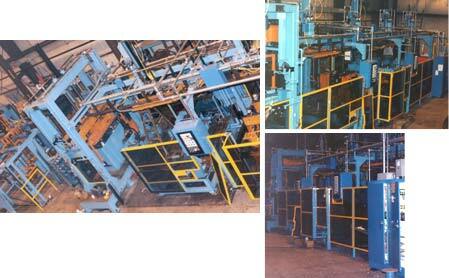 From large, medium, to small pierce equipment MLS Systems can do it all. 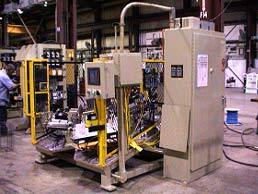 MLS Systems can provide multi-station trim/pierce and transfer stations or single station pierce machines as well as sub stations tooling packages and retrofits of your existing equipment. The large multi station trim & pierce system with transfer shown above, was designed to handle large capacity liners at a 15 second cycle time. 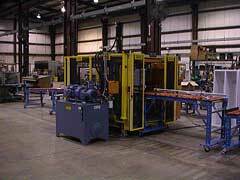 This custom refrigerator cabinet liner pierce system included a flat belt in-feed conveyor from an in-line thermoforming system. The cabinet liner scrap flanges were trimmed in a box shear before holes of various sizes and shapes were pierced into the liner body sides and ends. This system also featured a gantry style overhead transfer which contained carriages with redundant vacuum systems and capability to rotate the liners 90-degrees during transfer. This refrigerator liner pierce system was designed to pierce large capacity Side by Side liners with a 12 second cycle time. 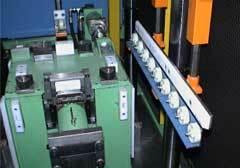 Liners are loaded in the front of the machine, pierced and exit out the back. This small liner pierce unit was designed for small capacity refrigerators. Liners were loaded and unloaded from the front of the machine which performed the pierce and trim operation in 10.5 seconds. 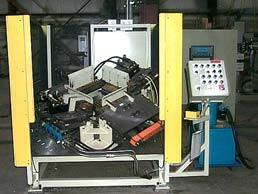 Special contoured dies and punch tools are no problem for MLS Systems to provide. 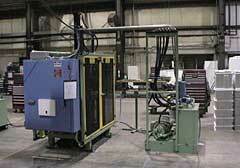 To reduce your equipment costs, our designers utilize standard punches and dies wherever possible. In cases where this is not possible special tooling like that pictured is used. View of Lock Out Tags and Interlocked Guarding. Special bilingual tags like the one above in Spanish and English, can be provided. 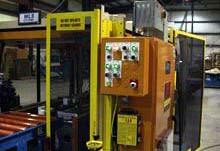 We can supply equipment and tags in accordance with your facilities lock out tag out procedures. The view above, shows how the liner locating tooling on the liner support mandrel has been contoured to support the liner during the trimming and piercing operation. This view also shows a liner flange trimming tool which nipped profiles into the corner of the liner as the holes in the liner body were pierced. 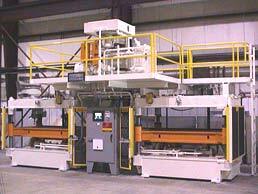 Your liner pierce machine can be equipped with light curtains, palm switches, and interlocked guards for operator safety as well as powered or non-powered in-feed and exit conveyors to ease operator load and unload. 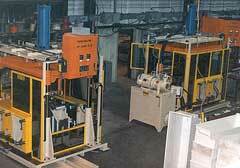 If your production requirements include automatic liner loading and unloading, this can also be provided in a variety of methods. 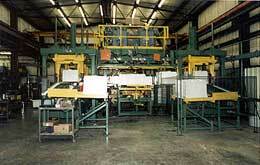 At left, a platen mounted transfer has been incorporated. 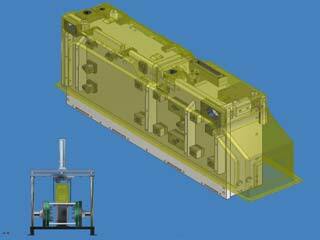 MLS Systems utilizes the latest in 3D modeling software in the design of our equipment which reduces mistakes to intricate tooling components found on most liner pierce projects. 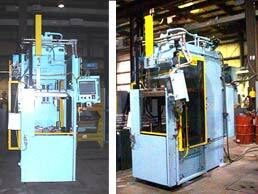 This machine is used for piercing refrigerator door panels. 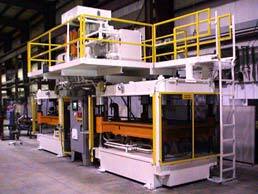 The hydraulic power unit was mounted on a mezzanine above the dual presses to conserve floor space. 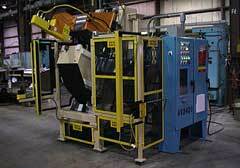 This wire basket trimmer is angled for ease of operator load and unload. 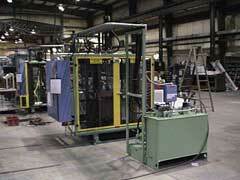 It also has the capability to trim multiple basket profiles with a 15 minute tool change. Trimming operation takes less than 6 seconds to trim 38 places on the basket perimeter. 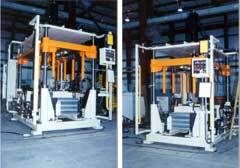 The dual press configuration runs two different models of doors but share PLC and hydraulic power unit. 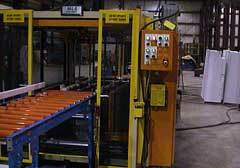 MLS Systems has built many basket trimmers like the one pictured. 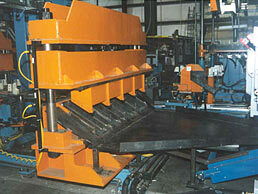 Banks of precision guided blades are indexed in sequence to trim the top perimeter of wire baskets. 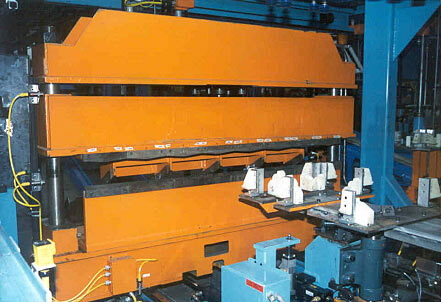 MLS Systems has built many C-frame notch and pierce machines like the one pictured. 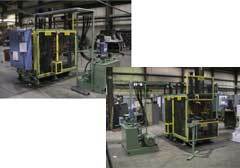 Panels can be manually placed or automatically indexed under the C-frame heads for the required notching and piercing operations. 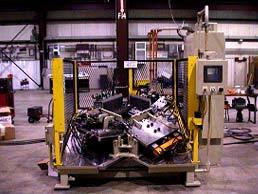 This hydraulically actuated C-frame pierce machine was used to pierce a pattern of round and square holes into tube material for an automotive customer.